Mormon Wookiee: #104: The Garden of Gethsemane. Easter is one of my favorite holidays. Think about it--what possible event could be a greater cause for celebration than the resurrection of Jesus Christ? It is the greatest, most hopeful, most powerful miracle in all the world. Because of Him, we ALL will be resurrected. "And he was withdrawn from them about a stone’s cast, and kneeled down, and prayed, saying, Father, if thou be willing, remove this cup from me: nevertheless not my will, but thine, be done. And there appeared an angel unto to him from heaven, strengthening him. 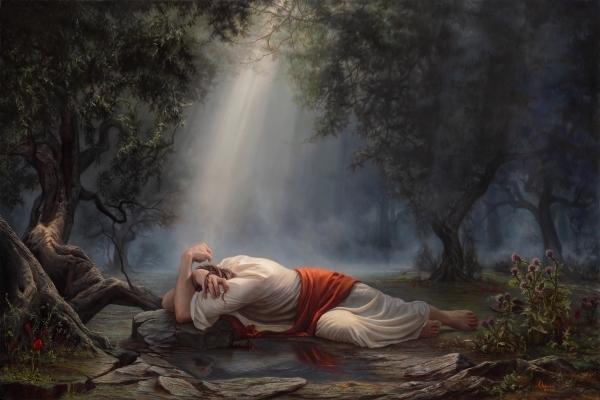 And being in an agony he prayed more earnestly: and his sweat was as it were great drops of blood falling down to the ground" (Luke 22:41-44, emphasis added). The Church has recently produced some incredible videos of the Savior's life and ministry. One of the most powerful of these videos focuses exclusively on the Savior's time in the Garden of Gethsemane (video length is about nine minutes). Watching the video strengthened my love for the Savior and gave me greater appreciation for the pain and suffering He experienced there. I have posted the video below and encourage all to watch it. How grateful I am for Jesus Christ. Because of Him, not only will we all be resurrected, but we also have the opportunity to repent and be forgiven of our sins. I can't imagine any greater blessing than that.